A view of the chaotic installation. Courtesy of Thomas Hirschhorn. Photo by Mark Blower. We love a good piece of large scale immersive installation art, so were excited to see what Thomas Hirschhorn would do with the main space at Camberwell's South London Gallery. But is the artist's work more destructive than it is creative? And does it matter? Hirschhorn's use of found materials to create a mazy work for visitors to explore reminded us of Phyllida Barlow's installation at Tate Britain. But unlike that work, this is a much darker exploration of the overlap between creation and destruction. Everyday and found materials are used to put together something resembling a bombed out building, with brick patterns painted on the walls and cardboard used to recreate broken concrete with protruding 'steel rebars'. As visitors navigate the purpose-built ruins, they encounter an upside down chair, radiators, old toilets and even a bathroom sink suspended from the wall above head height. The Swiss-born artist has been researching bomb sites for his work, and it shows in the black membrane suspended above the assemblage — littered with holes similar to the photographs we've seen of walls and ceilings in the middle of war zones. That much of the installation is held together with tape, makes visitors question whether it was created like this or whether it originally had a different form before being wantonly, yet thoughtfully broken apart. Visitors will see the quote: 'Destruction is difficult. It is as difficult as creation'; the exhibition invites visitors to question what the two terms mean — are they the same thing after all? Doesn't destroying one thing ultimately create something else? 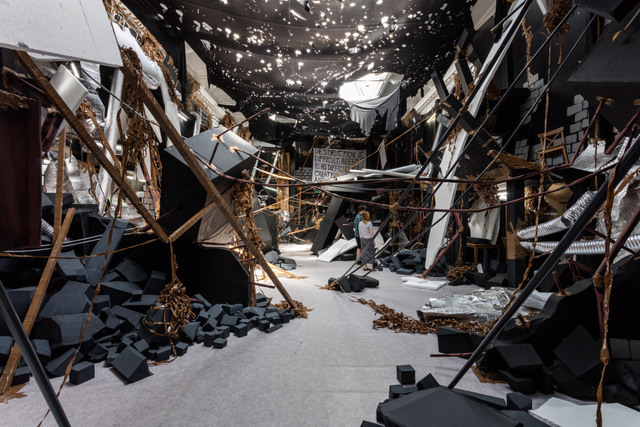 Despite the size of this installation, the copious use of black means it can feel quite claustrophobic and though never intimidating, it is unsettling — something that Hirschhorn has set out to achieve. Thomas Hirschhorn: In-Between is on at South London Gallery, 65-67 Peckham Road, SE5 8UH until 13 September. Entrance is free. While at the gallery it's worth checking out their excellent café. For more art see our top openings for July and our most talked about exhibitions in June. There's more immersive art in Carsten Holler at Hayward Gallery, the Royal Academy's Summer exhibition and Ben Woodeson's electrocuting art.